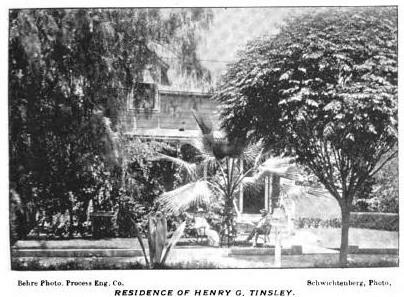 Henry Greenwood Tinsley was born in Lyons, NY in 1861 and passed away in Pomona, CA in 1920. His vivid memories of his childhood and childhood home were found in the local history section of the Lyons Public Library in 2010, 99 years after he put them to pen. He was a reporter for the Lyons Republican, Rochester Democrat, Rochester Herald, and the New York Sun after graduating from Cornell University in 1883. Then in 1888 he headed west where he purchased a half interest in and became the editor of the Progress in Pomona, CA. In 1889 he returned to Wayne County and married Miss Helen Griswold in Lock Berlin and they returned to Pomona immediately. At some point he became the editor of the Review in Pomona. It is wonderful to have this glimpse into the past. Henry, under the shade of a palm, remembering Lyons. LYONS AS I REMEMBER IT FROM 1870 TO 1888. My memory of Lyons begins with about 1870, when as a tow-headed, freckled-face boy on Phelps Street, opposite Grace Episcopal church, I began to sit up and take notice of men and affairs about me. I look back upon that as the Augustan age in the annals of Lyons; but I suppose that almost everyone views the place and period of his boyhood in the same light, for youth is the golden age in the book of life. Away out here on the shore of the Pacific, in the land of the palm and the olive, I look back upon Lyons in the days of my youth as about the happiest and nicest community I can imagine this side of paradise. My close knowledge of Lyons ceased on my removal to Southern California early in 1888. My deceased father sold the Republican office to Wm. G. David, September 15, 1887, and I at once began preparation for my long-cherished plan of coming to a semi-tropical clime on the western sea to spend all my days. But I shall never conquer my love for the town of my nativity and the scenes of my boyhood. And will never come again. " occupied by the Croul and Aggett homes in my boyhood. Grace church is practically now as it was forty years ago, except that the picturesque ivy that used to clamber up the stone tower is gone. The Methodist church exterior is unchanged, and the same may be said of the exterior of the Presbyterian church. I well remember the quaint old graveyard all about the Presbyterian church, and how on Sunday mornings we boys used to wander among the decrepit weather stained headstones, exercising our newly found knowledge of the alphabet in reading the carved epitaphs, of "some village Hampden", whose bones lay there interred. Over at the New York Central railroad the greatest changes in local topography since my boyhood have been made. I well recall the little old wooden passenger station that stood north of the tracks, the two straight railroad tracks that reached through the town, and the old shed where wooden chunks were stored, for coal-burning locomotives were then unknown and our western oil-burning engines were undreamed of. I recall the funny old red-painted railroad bridges that antedated the steel structures. And I look back with fond recollection to "Cap't" Dunn's wood that stood where the Central railroad yards now are; and I remember the Sunday school picnics we used to have among the maple and chestnut trees, where the roundhouse now stands, and how Rev. Dr. Bell, Dr. Sylvester, Henry Teachout, William Bradley, and Columbus Croul ( all gone from earth long ago) were the moving spirits at the festal affairs alongside Clyde river and beneath arboreal shades. Elmer's hill and the Hocroft loomed up big in our eyes in those days. What romance and fanciful Indian legendry we. boys, who then read of Comanche and Apache wars in the West, used to weave about those highest eminences in our boyish world! But they seem pretty tame now, by the side of our towering, snow-capped Sierras. There was no West Shore railroad there in those days. The only use the world then knew for electricity was for the telegraph, and so there were no electric railroads, no telephones, electric lights, no moving pictures. The gas house was there long before I was born, exactly as it is now. That and the funny little old jail at the head of Church street have remained exactly as I first saw them over forty years ago. Then, as now, the canal locks were the scene of activity in Lyons, and one: of my early recollections concerns the annual Spring row about whether a Durkee or Sam Bellinger was to have the stipend of $40. a-month at tending lock, because he had voted right in the town election. The Lyons that I knew earliest was animated with stories of battle-scenes and camp life in the Civil War that had closed a few years before. I well remember how each winter the soldier boys would bring forth their war-time blue overcoats with little capes, and wear them till Spring. The popular songs of the day were brought home from the war by the Boys in Blue, and every lad in town could sing " When Johnny Comes Marching Home" and "Captain Jinks". Col. Alex D. Adams was principal of the Union school, and the women teachers were selected, not so much for their wisdom or training in pedagogy, as for the fact that they had lost a father or a brother or husband in the war. The candidates on all political tickets had to be selected in some degree from among the soldier boys. Grant was President and the idol of the North; and the whole national bent was military. I remember that once when Admiral Farragut passed through Lyons, the whole town got up at six in the morning to go over and see his train. The leaders in Wayne county affairs in those days have wholly passed into eternity, with only one exception - former State Senator Thomas Robinson, of Clyde. John H. Camp was district-attorney in my early boyhood. He was elected to Congress in 1876 and remained there until Sereno E. Payne's nomination in 1882. Mr. Camp was head and shoulders above any other political leader Wayne county had, or had ever had, in my day. When I became a young man and came to know him well, because his law-office was directly above the Republican editorial room, I learned to know that his element of strength in law and in politics was his hard-working zeal to master all details, his delightful personality, his ability to be a "mixer", and his alert mentality. Mr. Camp would have made success as an attorney and political leader in any field. Anson S. Wood, of Wolcott, was member of Assembly, and supposed to be on the road to governorship. Judge Cowles was on the county bench. R. P. Groat was keeper of the Alms house and later sheriff. Chas. T. Saxton was a struggling young lawyer in Clyde, with John Vandenburg. John McGonigal was school commissioner. Judge Collins was county clerk in the old building, now used as the village police court and lock-up. James W. Dunwell was just out of Cornell University, and was reading law with Col. Joseph Welling in the Masonic block, just above the entrance to the old post-office. Gen C. D. McDougal, of Auburn, was Member of Congress, and the post-offices, and a long list of internal revenue offices, were occupied by men who had gone to war to save the nation. John P. Brownell was sheriff of the county when I first began to know there was such an officer, and he was in mortal fear all one winter lest he should have to hang a murder from Rose, named Graham. Later Charles H. Roys became district attorney, and then John Vandenburg, then Jefferson Hoag and-then Charles H. Ray. They are all dead now but Mr. Hoag. Of the sheriffs, I remember R. P. Groat, Thomas P. Clark, William J. Glen, Vernon R. Howell, Ross J. Parshall; and they too are dead. Only recently, Wm. R. Stults died in New Jersey. He was a prominent man in Wayne county politics in my day, and was esteemed by all who knew him. Looking back at the forty years I remember Wayne County political Affairs, I want to pay a tribute to the perennial hopefulness of the Democrats of old Wayne. It is beyond my comprehension. From 1856 till now they have each year put forth an effort to carry the county. In season and out, the sons of Andrew Jackson have put up a campaign cry, "Now, the works are surely ours." Like Tennyson*s brook, campaigns may come and go, issues blossom and ripen, leaders lead on or drop out, but the hopefulness of the Wayne Democracy goes on forever. With but one exception - the election of 1869, when A. F. Redfield of Clyde defeated Judge Collins of Lyons for county clerk - Wayne County has never given a majority for any Democratic candidate. The party has elected several Members of Assembly, when there were two Assembly districts in the county, but the county has invariably gone Republican, with one exception, during fifty-five years. Only one business man remains who was contemporaneously in business in Lyons when my deceased father was there. This is the esteemed friend of my boyhood, Daniel Moran. A. M. Medbury has been a quasi-merchant in Lyons for about sixty years, but I understand he has ceased to be the Wanamaker of Lyons. I could fill columns of The Republican with names of patrons of the advertising columns of The Republican in my career in the office, who have died or moved away. When I was a little boy, Caleb Rice was the merchant prince of Lyons. He and the late E. G. Leonard were the great apple and wool buyers of the town. Their store was where the Boeheim furniture store now is. Mr. Rice lived and died in the brick house next east of the Elks’ Home. He had the handsomest horses and carriages and cutters in the locality, and his was an imposing figure as he drove about town on a winter afternoon, with his seal-skin cap and elaborate sleigh robes all about him. I never see the enormous warehouses of wool - often comprising a stock worth $1,500,000 - in Los Angeles, but what my mind goes back to the rapt admiration with which I used to stand on Water Street and observe $4,000 or $5,000 worth of wool going into the Rice and Leonard store-room. The Lyons that I first knew, in my boyhood, was at the high-tide of prosperity, succeeding the Civil war and during the Franco-Prussian war. Those were the palmy days for the Wayne County farmers, the bone and sinew of Wayne’s success, I remember when the Nelson Mirick mills (on Geneva street near the river bridge) ran day and night, and when Miles Leach’s mills on Water street were a little hive of human industry & when wheat sold for $2.50 or $2.75 a bushel. That was before the iron horse on the steel rail made the western farmer a competitor of his eastern brother, and before the great flour mills of Minnesota had put New York and Atlantic coast millers in bankruptcy. I remember when there was a flour mill on every water course in Central and Western New York, when there were a dozen malt houses in Wayne County, and all highly prosperous; when there were wagon and carriage shops in every hamlet, and when the old Erie was a very active water-way of commerce. The one, who did most for the upbuilding of Lyons was a very active man, in my day, in the town. I refer to DeWitt Parshall. He died in 1880, and I remember him as clearly as if I saw him only yesterday. I have observed, here in California, some wonderfully energetic business men, but I have seen very few like Mr. Parshall. He was a human steam-boat. His was an intensely practical nature. He despised shams, and laziness he could not endure. He started in life a poor farm boy in Palmyra and left an estate that was appraised at $650,000. He was a devout Episcopalian, and I remember when a boy seeing Mr. Parshall at the Church service every time the bell rang. Between 1867 and 1880, Mr. Parshall must have spent over $180,000 in buildings in Lyons, and when he died, his will directed the block known as the Parshall memorial to be erected. Looking back twenty-six and seven years, I recall quite a list of famous Americans who have honored the Republican sanctum sanctorum with visits so interesting that I can never forget them. Former Vice President Schuyler Colfax lectured on Lincoln at Towar’s Hall (now Zimmerlin’s) once; and I remember how he spent most of one day chatting with my, father about his (Colfax’s) newspaper career in Indiana. On another occasion. Gen. Slocum, the hero of Gettysburg, was a visitor for a few hours while he waited for a New York train. Ambassador Andrew D. White spent an evening in the office twice within a few years, when delayed in taking a Lehigh Valley train for Ithaca. One cold snowy day in November, 1883, a young man walked into the newspaper office, and asked where he could find Mr. Camp, whose office was above the Republican editorial rooms. He said he had come to Lyons to see Mr. Camp on legislative matters. I can see him now, with his fat, rosy cheeks, and prominent white teeth, as he laid his card down on the editorial desk. The card bore the name "Theodore Roosevelt.” Mr. Camp was in Rochester that day, and young Assemblyman Roosevelt sat in the great rocking chair by the plate glass window and waited. He was already famous in New York state for his fight with Tammany Hall in the Legislature of 1882 and 1883. He was then candidate for speaker, and he had come at the suggestion of Thomas C. Platt to see Mr. Camp. I recall that the conversation was largely concerning the return of the survivors of the ghastly expedition under Gen. Greeley to the North Pole a few months before, for that sort of heroism appealed to Roosevelt. One evening Bayard Taylor, on his way to lecture at Cornell University, stopped a few hours in Lyons, and with journalistic instinct made straight for the Republican office. On another occasion Robert C. Ingersoll spent the greater part of an evening there. He lectured at Memorial Hall, and Burton Hammond brought him around to see the editor. I well remember hearing John B. Gough tell, in his inimitable style, several stories in the Republican office, one day after he had lectured at the Methodist church. It was a memorable day with us when P. T. Barnum once came to Lyons with his circus, and was escorted to the Republican office by John Mills. Roscoe Conkling was a short visitor to the Republican office along about 1880. I remember that he had been a guest at the Wadsworth home in the Genesee Valley, and was driving home to Utica with his coachman, and he stopped off in Lyons to see Mr. Camp, who brought the Great Imperial Roscoe in for a call. In the Fall of 1887, James S. Sherman, then a new member of Congress and now Vice President, came to see his former college chum, Charles H. Ray, and I have a particularly clear recollection of the pleasure of an hour's visit that Mr. Sherman made at the Republican office. From a careful perusal of the Republican each week, I gather that Fourth of July celebrations have ceased to be the popular annual institution in Wayne County they used to be in the dear old days. but in California the celebrations of the Fourth flourish in all their pristine glory, and they have some great ones out here, too. I never view the morning procession or hear the snapping of fire crackers, but my mind goes back to the days when we used to look upon the national birthday event as the one sublime-occasion in the calendar. I can see those celebration events now as clearly as if they took place this day. I feel even now the patriotic fervor which the pealing notes of Grace church bell used to rouse within my boyish soul at dawn on each July 4th. I can see the firemen, environed by crowds of barefoot boys, assembling at the old engine house on William Street opposite Counselor Clark's home. I can see in my mind's eye the parade of red-shirted firemen with big oil-cloth helmets, led by Adam Schattner's band and followed by the Rose Valley cornet band, as it proceeded majestically north on William street, then back to Canal street via Jackson and Phelps. I wonder whether I shall ever forget the profound admiration with which we boys (who followed close at the heels of the band that made the loudest noise) looked upon Bill Bailey and Jesse Buell, who carried under their arms brass speaking trumpets, and bossed the firemen on those days, or of how exalted it seemed to be a man who could haul a flower decked hose-cart about town to the martial strains of a brass band. Then came the speaking and literary exercises in the Park, at 11 o'clock, where, amid a snapping of fire crackers and cries of weary hungry children, a young lawyer annually told us how the great day came into existence. I must not omit mention of the afternoon barrel races on Broad street, the tub races on the canal from the Graham house bridge to Price's grocery store, of the greased pigs which men chased through the park, which was fenced in in those days, and of the greased pole that was invariably placed near by Joe Myers's saloon in the square at the canal locks. Neither must I omit mention of the firemen's ball that always took place in Towar's Hall on the night of the Fourth, and the fire works that H. 0. Filer set off to the amazement of the populace on Broad street. I wonder what the boys of Lyons do now-a-days to remember the Fourth, the one great and only day in the local annals.